Eighteen months ago, we reported that when Google.com went down for a few minutes, it caused a 40% drop in pageviews. With Facebook and Instagram down for almost an hour this morning, we investigated what impact, if any, the outage had on global traffic levels and activity. Well, it looks like the impact of the Facebook downtime was considerable. Facebook is huge and remains the dominant social network for referral visits (visitors who are linked from one webpage to another, like clicking an article on News Feed). This graph shows the impact Facebook’s downtime had on all social traffic. It shows pageviews resulting from a social source as tracked by GoSquared’s real-time web analytics at any one time. 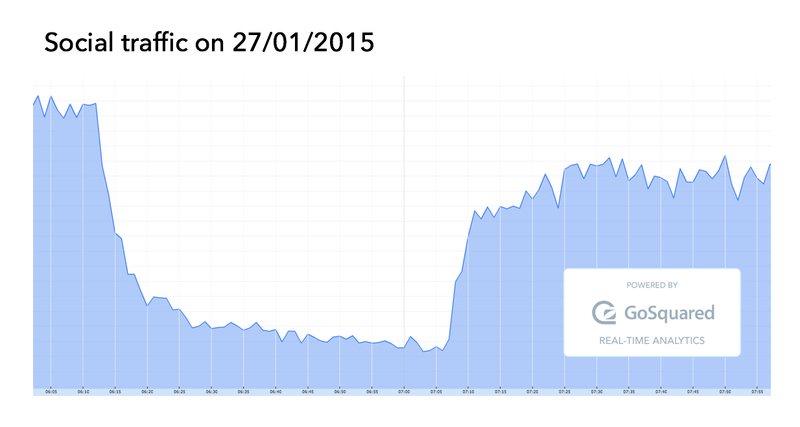 The Facebook downtime between 06:00 and 07:10 UTC caused an 80% drop in pageviews from social during that period. This graph demonstrates that Facebook directs the lion’s share of referral visits. Despite changes to the News Feed algorithms and the visibility of pages, Facebook remains the most important social media platform for driving visitors to content. Explore other Global Metrics from GoSquared and sign up for updates on significant changes we’re reporting in global activity. Disclaimer: This data is based on a representative sample of global traffic trends. GoSquared tracks billions of pageviews every month across over 60,000 sites. Andrew leads marketing at GoSquared.